For those of you who are reading this, not living in and around the Manchester area and have never heard of the name Charles Brett, please read on. Sergeant Charles Brett was a member of the Manchester constabulary in its formative years, during the days of the horse and cart [van]. He was also the first member of that police force to be killed in the line of duty. He was shot in an ambush whilst travelling in one of these horse drawn police vans, escorting two Fenian prisoners to Belle Vue gaol, at a spot that became known locally as the Fenian arch. But whilst Sergeant Charles Brett, has been mostly forgotten, the perpetrators of this crime are still honoured to this day. Even 142 years after the event, there are still memorials and parades in honour of the Manchester martyrs. In this article, it is our hope to redress the balance and honour the victim rather than the perpetrators of the crime. William Brett was born in Dover, Kent in 1790 and his wife (Mary) was born in Macclesfield in 1793. In the 1851 census, William Brett is listed as being a ‘hat maker’, with Mary being listed as a ‘silk doubler. William and Mary settled in Macclesfield where Charles was born circa 1816 and his sister Ellen followed circa 1820. It would appear that Ellen Brett was never to marry, having lived at home with her parents for the duration of her life. Subsequently, no trace of any heirs can be found. Charles Brett; however was to marry a Macclesfield woman with the same first name as his mother, Mary. They were married in 1830 and had four children. Their first child, William was born in 1837, followed by Mary in 1844, Charles in 1846 and Elizabeth Ellen Brett, born in I850. Charles and Mary Brett remained married until Charles’ untimely death at the age of 52, being shot on the 18th of September 1867, whilst in the discharge of his duties. He was laid to rest in Manchester general cemetery, along side his father William who died in April 1875, his wife Mary, died December the 5th 1893 and his two Grand daughters, Annie Atkin, died 1873 aged 3 months and Ellen Atkin, born January 27thst 1880, Died February 1 1880. Carved on his gravestone are his dying words of defiance, when asked to hand over the keys he replied, “I DARE NOT, I MUST DO MY DUTY”. 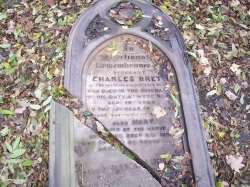 Unfortunately, due to both the passage of time and disrespectful vandalism, the gravestone of the Brett family has now fallen into a serious state of disrepair. Manchester was incorporated as a borough in 1838 and a Town Council with the power to raise rates was set up, albeit with some local disagreement. With the passing of The Manchester Police Act of 1839, Sir Charles Shaw was appointed as Commissioner of a new Police Force that was to be run along the same lines as the Metropolitan Police. The new force came into being on the 17th of October 1839, with an initial strength of 200 Constables; this was soon to be increased in size to 357. On September the 18th 1867, Sergeant Charles Brett, became the first member of the Manchester Constabulary to be murdered in the process of carrying out his duties. 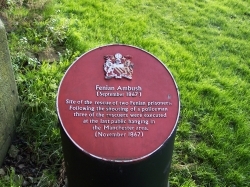 He was shot and fatally wounded whilst escorting two members of the Fenian movement [the Irish Republican Brotherhood of Fenians] along Hyde Road to the prison at Belle Vue at what was to become known locally as the Fenian Arch. A memorial tablet dedicated to the memory of Sergeant Brett was erected in Saint Barnabas Church, in Ancoats, Manchester. The inscription on the memorial reads “Erected by the members of The Manchester Police Force and Friends, in memory of Charles Brett, A Police Sergeant of the City, who for many years worshipped in this church until he fell at his post of duty, a victim of the Violence of Sedition, 18th September 1867. A faithful man, though proffered life, he chose a cruel death rather than betray his trust. In 1959 upon the closure of Saint Barnabas Church, this tablet was removed to Saint Ann’s Church, Saint Ann’s Square, Manchester, The parish church of the Manchester City Police Force. It is not our intention to glorify any more than they already have been the perpetrators of the heinous murder of Sergeant Charles Brett. They have gone down in the annals of history as “the Manchester martyrs”, whilst their victim, a 52 year old police sergeant, has been, by and large forgotten and ignored. To tell Sergeant Brett’s story, it is however impossible to ignore the cowards who were party to his death, so we lay the basic facts before you. If you want reasons, hypotheses or excuses, there are plenty of other web sites that will offer those. During the early hours of the 11th of September 1867, two men found loitering in Oak Street in the Shudehill district of Manchester were detained by the police. They were charged under the Vagrancy Act on suspicion of having the intention to rob a shop. At first the identity of these men was unknown to the police. They were however eventually identified as Colonel Thomas J. Kelly and Captain Timothy Deasy, both Irish Americans who had fought in the American Civil War. They had both travelled to the British mainland to preach sedition and reorganise Fenians on the mainland. The authorities, now knowing the importance of their prisoners, took extra security precautions, .twelve armed policemen guarded the prison van containing the prisoners on their journey from the court in Manchester to the prison at Belle Vue. Sergeant Brett, armed with a cutlass was the sole policeman stationed inside the locked prison van, guarding the two Fenians and four other prisoners. 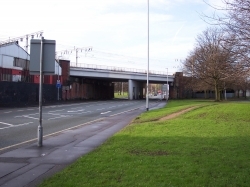 The journey To Belle Vue took the police van by way of a railway arch on Hyde Road, situated on the boundary between Ardwick and West Gorton. As they passed under the arch, one or two men [depending on which version you believe] stepped out in front of the police van, pointed a pistol [pistols] at the driver and told him to stop. At first the driver tried to drive on, but shots were fired forcing him to stop. The police van was then surrounded by a horde of Fenians armed with guns, hammers, sledgehammers, hatchets and crowbars etc… One group of Fenians formed an extended circle around the van with guns in hand to keep at bay any would be police re-enforcements, whilst the remainder set about attempting to prise open the police van. After many unsuccessful attempts to prise open the van, the assailants called upon Sergeant Brett to give up his keys to which he responded “I dare not, I must do my duty”. It must have been at this point that Sergeant Brett looked through the keyhole of the lock to see what was going on outside, at the same moment as one of his attackers placed his revolver to the keyhole of the van in an attempt to shoot out the lock. The bullet passed through his eye and into his brain, killing him. Kelly and Deasy were in individually locked compartments within the police van, separate from the other prisoners, one of whom took the keys from the dying Sergeant Brett and passed them out through an opening to those besieging the van, thus the two Fenian stalwarts affected their escape. Other casualties of the assault were a member of the public shot in the foot, another police officer was shot in the thigh and the horses, and they were shot in a bid to stop the van. A reward of £300 was offered for information leading to the re-capture of the absconded prisoners, though this was never claimed and both Kelly and Deasy reportedly made their way back to America. Twenty-six of their confederates were arrested for the crime and incarcerated in the New Bailey Prison, Salford to await trial; twenty-three of them were incarcerated on the 5th of October with the other three to follow on the 16th of October 1867. The New Bailey, by then had been in use for eighty years, but had proved to be too small and was to close in the later half of 1869 after the opening of Strangeways Prison in Manchester. There were many more suspects arrested than the twenty six men who stood before the Manchester Assizes Court on the morning of the 26th of September 1867 accused of murdering Sergeant Brett. Out of the twenty-six accused, twenty-five were Roman Catholics; the twenty-sixth was a member of the Church of Ireland. Twenty-three were born in Ireland, two in England and one in New York [U.S.A]. Two other suspects were later arrested under suspicion of having been party to Sergeant Brett’s murder, both were Roman Catholic’s, one, Thompson [who’s real name was Daniel Darragh] came from Scotland and the other, Patrick Melody came from Ireland. They were both tried and convicted some four months after the original trial took place. Both were found guilty. Thompson had been arrested whilst in possession of a cache of revolvers akin to those that were used to stop the prison van on its journey to Belle Vue prison. He was sentenced to death, however owing to ill health; he escaped the hangman noose and died in prison on the 28th of June 1870. Melody was identified at his trial as having been present during the ambush; he was pardoned and after having served eleven years in prison, emigrated from England to America. There were at the time of the arrest and trial of those who stood accused of Charles Brett‘s murder, the usual claims of persecution and victimisation of the Irish by the English, however of one thing we can be certain, and that is Charles Brett did not commit suicide someone shot him. You can only imagine the mayhem that must have ensued with so many accused standing in the dock when the trial opened. Out of the original twenty-six to stand trial for the murder of Sergeant Charles Brett, nineteen lived in Manchester, three in Salford, three in Liverpool and one in Ashton-under-Lyne. Of the twenty-six, two, Michael Kennedy and Henry Wilson [the only Protestant to be arrested], were acquitted and discharged. A further twelve were discharged when no evidence was offered by the Crown, one of whom was the only Englishman to have been arrested, Thomas Ryan who had been born in Salford. The remaining twelve were found guilty in varying degrees and of various charges. Seven of the accused were cleared of the murder charges but were subsequently found guilty of the lesser charges of the misdemeanour of assaulting police officers in the execution of their duty, and riot. They all received the maximum sentence that could be imposed on them, that of five years penal servitude and two years hard labour to run concurrently. All seven convicts were then taken to Millbank Prison, Pimlico, London, to await their Majesties pleasure. The remaining five were all sentenced to death, so in fact there were six Fenians sentenced to death for the murder of Sergeant Brett, but three of them managed to evade the hangman‘s noose. Thomas Maguire who had served as a soldier in the Royal Marines for many years was one of those who were sentenced to death. The death sentence was handed down on the 13th of November 1867. It would appear that he received an immediate free pardon from the Secretary of State, as he was released and walked free on the same day. Edward Shore had his sentence of death, commuted to penal servitude for life and was taken off to join his compatriots in Millbank Prison. William Gould[ alias O‘Brien], William O’Mera Allan and Michael Larkin, were all found guilty of having feloniously, wilfully and with malice aforethought killed and murdered Charles Brett, and were sentenced to death. After an evening of revelry during which strains of “Rule Britannia” may well have been heard in and around the environs of Deansgate, a healthy crowd had gathered the following morning to witness what was to be the last public hanging in the Manchester area. Shortly after 8:00 am on the morning of the 23rd of November 1867, the three convicts were taken to the gallows that had been erected at the New Bailey Prison. The authorities were taking no chances on any further attempts at rescue, and in consequence on the day had over 2,500 regular and special police on duty in and around the prison, being further enhanced by a detachment of the 72nd Highlanders and a squadron of the English Hussars. If reports of the execution are to be believed, the hangman [William Calcraft] was neither particularly proficient in the art nor proficient in the skills which were required to carry out his task as public executioner. It is claimed that he was renowned for his inability to make the necessary calculations required to effect an efficient execution. His party piece to rectify any errors of judgement on his part when calculating the length of rope required, was to descend into the pit beneath the gallows and pull down on the condemned mans legs, to put the finishing touches too and complete the hanging. Reports indicated that Allen was dispatched with the minimum of fuss, Larkin however did not fare so well and the executioner was required to perform his party piece. O’Brien it would appear was to suffer more than most. He had to undergo forty five minutes of mental torture, as well as the physical pain of the hanging, as one of the three Roman Catholic priests in attendance at the execution knelt, holding his had whilst praying, delaying the inevitable even longer. During the late 1980s and the early 1990s, it was the custom of Harpurhey True Blues L.O.L. 906, to hold a parade to the graveside of Sergeant Brett and perform a wreath laying ceremony. Unfortunately this lodge is no longer in existence and in consequence the Brett family gravestone has fallen into a state of disrepair and neglect. We have been in contact with both the Greater Manchester Police Force and the Manchester City Council bereavement and burials service to see just what can be done to rectify this state of affairs. Whilst there does appear to be some concern within the G.M.P. with regards to the condition of the memorial, as it is a family burial plot, they have no authority to affect any repairs to the gravestone. Manchester City Council, which is now responsible for what was once a private burial ground, is equally hamstrung. Again as it is a family burial plot, they too can do nothing to improve the condition of Sergeant Brett’s memorial without the consent of his descendants. We as an Institution, loyal to our Queen and Country, have spoken to City Council officials within the bereavement and burials service, seeking the authority to do something to bring this memorial of a man who died in the service of his country, back into a state of repair. ONE OF THE MANY WELL MAINTAINED MEMORIALS TO THE MARTYRS! Until 1974, the Manchester martyrs memorial committee had organised a parade to the memorial in Saint Joseph’s cemetery, Moston. It has been claimed that this parade became a target for a violent attack from right wing extremists, as a result of the outbreak of conflict in the occupied six counties, with their martyr’s memorial in Moston cemetery suffering from acts of vandalism as a result. This parade had been an annual event and would be held in Moston on the Sunday nearest to the 23rd of November, culminating with in a ceremony at the memorial [shown above]. The parade would start at Bexley Square in Salford at the former site of the New Bailey prison and continue on to Saint Patrick’s church in Livesey Street where an anniversary mass would be held, after which the parade would continue to Saint Joseph’s cemetery, Moston. The arrest and hanging of Gould [alias O’Brien], Allan and Larkin, was referred to in various quarters as the Manchester outrage, but it was as a result of a real outrage that this parade became the subject of a violent attack. On the 4th of February 1974, a coach carrying off duty members of the 2nd Battalion, the Royal Regiment of Fusiliers and their families, back to barracks in Catterick from Manchester was blown up on the M62 motorway somewhere between Bradford and Leeds. Credit for the perpetration of this real outrage against humanity was claimed by the Irish Republican movement. Travelling on board this coach was a soldier who lived in Moston with his wife and young family, all of whom were killed in this atrocity. A total of nine soldiers and three civilians were killed in this bombing and another thirty-eight soldiers/civilians were injured. A lasting memorial to those killed in the M62 coach bombing can be found at the motorway service station at Hartshead Moor on the M62 near Bradford. There was an attempt to hold another parade in Moston the following year, but common sense prevailed and it was not permitted to go ahead. Thereafter the commemoration of the death of these so called martyr’s, has taken place in the south of Manchester where there is a large population of immigrants from Ireland, who whilst professing to hate the “Brits”, still come over here to live. Surely if they feel so strongly on this point, the Free State would make a far better home? THE FENIAN AMBUSH PLAQUE AT THE RAILWAY BRIDGE ON HYDE ROAD - NOTE THE LACK OF RESPECT SHOWN TO SERGEANT BRETT,THERE IS NO MENTION MADE OF HIS DEATH! 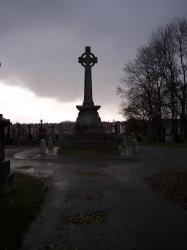 Whilst the Manchester Martyr’s memorial committee, no longer organise parade’s through the streets of Moston, a commemoration in some form, still takes place each year, at the memorial in Saint Joseph’s cemetery on the Sunday nearest to the twenty third of November. This was not the first occasion in which Charles Brett had found himself in a police van surrounded by an angry mob. Three years previously he had arrested a man for “causing uproar” in Bridge Street. The police van in which Charles Brett had been travelling and was heading towards the court which was situated on Bridge Street, had been followed by an unruly mob of around one hundred young men, who were behaving in what was described as a most outrageous manner. One William Bradley would appear to have been prominent amongst the protagonists. Sergeant Brett, having noticed Bradley’s aggressive behaviour, jumped off the police van, gave chase and arrested Bradley. At his trial, William Bradley was found to be guilty as charged, and given a choice of a fine of thirty shillings [£1.50], plus costs or fourteen days in prison. He opted for the latter and spent his fourteen days in prison. When visiting Saint Ann’s Church to view Sergeant Brett’s memorial tablet, we were told of a lady who had visited the church previously, also to view Sergeant Brett’s memorial, but for a completely different reason to ours. The lady in question related a tale of a long dead relative of hers, who served in the Manchester Police Force along with Sergeant Brett. The tale had come down to her through the generations of her family, that it should not have been Sergeant Brett in the police van accompanying these desperado’s, but her long dead ancestor, who had changed shifts with Sergeant Brett. How different history may have turned out for many different people, if Sergeant Brett had not swapped shifts with this lady’s ancestor? There is but the one memorial to Sergeant Charles Brett, that is the tablet on display in Saint Ann’s church, and even that is in a recess above a sink, however ask anyone on duty within the church as to the whereabouts of Sergeant Brett’s tablet, and they will be only too pleased to show you its location. His family gravestone lies on its back, smashed in two. WE BELIEVE THAT HE DESERVES A BETTER MEMORIAL THAN THIS! By contrast, the search for memorials to the persons convicted of his death discovered the following. In, Birr in County Offaly, Saint Lawrence’s Cemetery in Limerick, Maid of Erin - Kilrush in County Clare, Glasnevin Cemetery in Dublin, Ennis in County Cork, Clonmel, and Tipperary etc. There is also a wall mural in West Belfast depicting the Manchester Martyrs, requesting the return of their earthly remains. 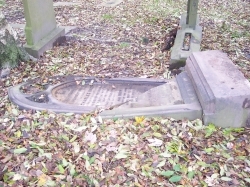 These remains now rest in a communal grave in Blackley Cemetery, North Manchester. Their remains had initially been interred in graves within the grounds of Strangeways Prison, having been buried in quicklime [a fate that it would seem is particularly offensive to members of the Irish Republican community]. At some point in time, the remains of all convicted felons were removed from the burial ground within Strangeways Prison and removed to the communal grave that they now all share in Blackley, making the repatriation of the remains of any individuals fairly difficult!. The main focus of this article has been to bring to the fore, the story of a man who hitherto has been largely ignored and totally overshadowed by those who were convicted of his murder. It is hoped also that it will bring about the restitution of his gravestone and perhaps some recognition at the site of the ambush, that a man lost his life, and who he was. In the Roman Catholic Liturgy a Martyr ranks before all other saints. Was a prison situated in Pilico, London, and was originally intended for the use of housing those convicts awaiting deportation to Australia. On the 22nd of May 1787, the memorial stone marking the building of the gaol and penitentiary house was laid by the chairman of the quarter sessions. The chairman was one Thomas Butterworth Bayley and in time the prison came to be known as the New Bailey. It was closed in the latter half of 1869 after the opening of Strangeways Prison. If we use the terminology Fenian, we are deemed to be being derogatory. Fenians themselves however are quite happy to be known by one another as fenians. A Fenian however is a member of a secret Irish-American revolutionary society, the Irish Republican Brotherhood [IRB], formed in 1858 by James Stephens [1828-1901]. The Fenians staged an unsuccessful rising in Ireland in 1867 but the IRB’s influence continued into the 20th century, when it was superseded by the I.R.A. So perhaps Sergeant Brett may have been the first [if not one of the first] victim of Irish Republican terrorism?